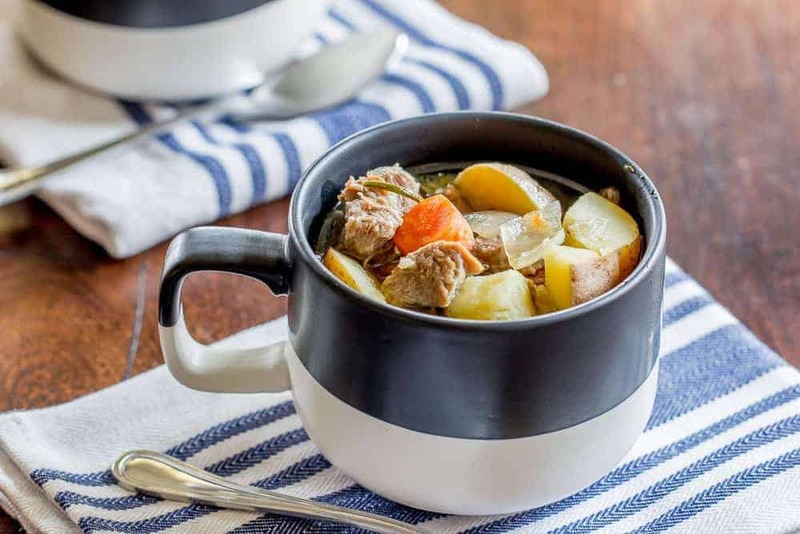 Instant Pot Irish lamb stew is a comforting meal full of tender lamb and vegetables. Warm up with a bowl tonight. If I close my eyes and breathe deeply, for just a moment I can forget January and be at peace. Usually February is the month I detest, but this year it seemed like January would never cease. Overall one would think we came out even, with a family trip to Hawaii and a work trip to Florida, and plenty of time spent with people I love in both places. But the things that were bad squeezed the good things until they popped, like a child squeezing a balloon. A very temperamental child. I even decided to open a bottle of wine on January 31, as a way to say good riddance to the month. Note that we don’t often drink wine at home, because I hate opening a whole bottle to only drink one glass. But making risotto was a good excuse for wine, so I set to work opening the bottle. January was here to remind us that we’re not in control. But February? I have high hopes for you. 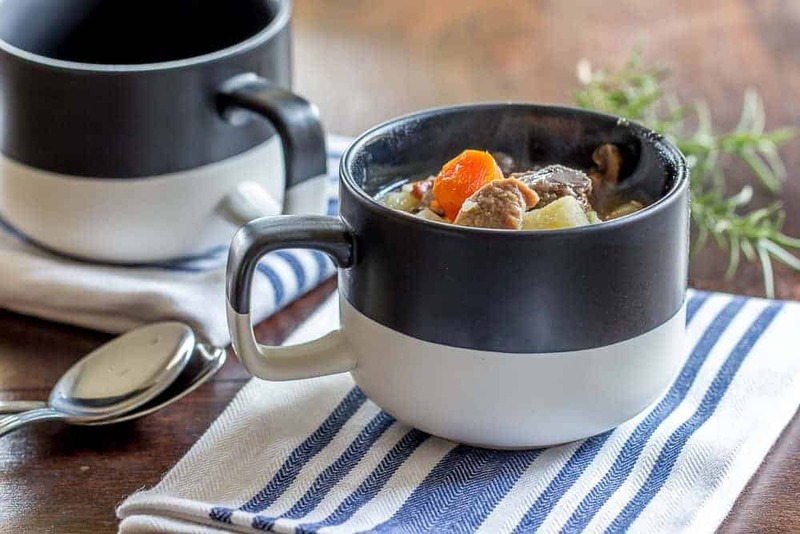 It’s not that the first day of February has been markedly better than January, except for the fact I was able to hunker down over a steaming mug of this Instant Pot Irish lamb stew. Meals like this slow everything down, even when they are made quickly. Now, I love to simmer soups and stews over the stove, but when my my work day is fully loaded, it’s hard to remember to use the bathroom, much less stir the soup. We use ours nearly every day, from breakfasts like quiche and bacon and egg risotto, to dinners like this stew. 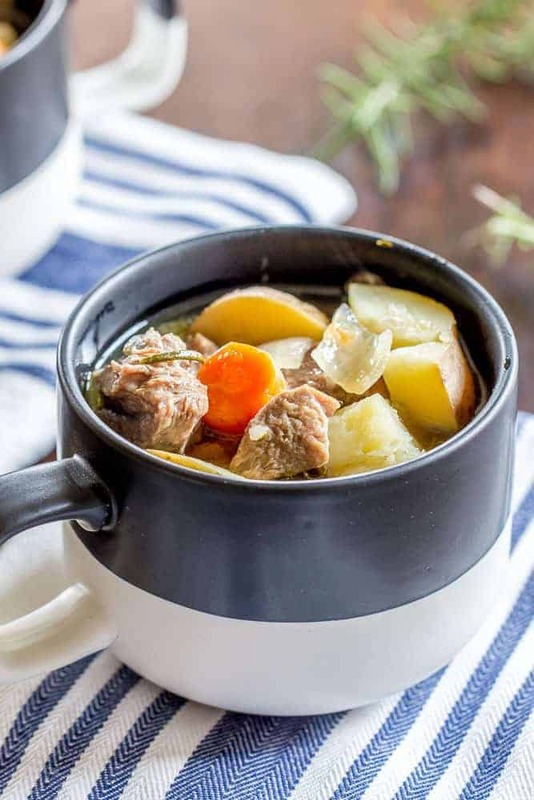 Irish lamb stew is very similar to classic beef stew, simply using lamb instead of beef. I like cooking with lamb for a nice change from beef, especially because it is a much more sustainable meat in terms of production. The flavor is often much milder than you might expect, depending on the cut and preparation. All in all, it’s a great meat to add to your dinner plan. 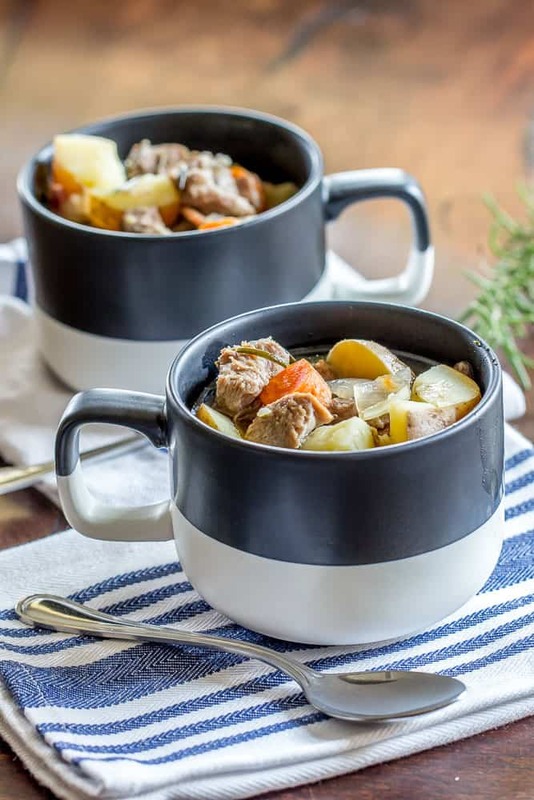 Another great thing about this stew is that if you have whiny children who refuse to eat it, your leftovers will be even better the next day. And your lunch will already be done. Take that, 2018. If you prefer to use your slow cooker, follow the same method for browning in a sauté pan, then transfer to the slow cooker. Add all the ingredients and cook on Low for 8 hours. Don’t forget to remove the bay leaves and stems from the rosemary and thyme before eating. If you prefer, you can use a bit of tied cheesecloth or empty teabag to create a bouquet garni that you can remove easily after cooking. Don’t forget to scrape up the browned bits from the bottom of the pot after sautéeing the meat. This makes the broth’s flavor richer, as well as thickening it just slightly. Cut your vegetables approximately the same size for even cooking, otherwise you could end up with mushy ingredients. Mushrooms are not a traditional ingredient, but are great for added umami. Serve the stew with biscuits or crusty bread. Place chopped bacon into Instant Pot and set to Saute. Cook until bacon is browned and fat is rendered, about 5 minutes. Place the lamb in a bowl. In another bowl, mix together salt, pepper, and flour, and pour over the lamb, tossing to coat. Add the lamb to the bacon and brown on all sides. Pour in 1 cup of the beef broth, scraping up any browned bits from the bottom of the pot. Add the rest of the broth, and the bay leaves, rosemary, and thyme. 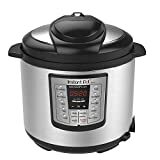 Close the Instant Pot and set to Seal. Cook on Manual High Pressure for 30 minutes. When the timer beeps, do a manual release of pressure. Add the onion, mushrooms, carrots, and potatoes. Close the pot again, re-seal, and cook on Manual High Pressure for 10 minutes. When the timer beeps, let rest for 10 minutes, then do a manual release of pressure. Season with salt and pepper to taste, then serve. Really great recipe! Only made a tiny change and that was to replace 2 cups of broth with Guinness…cause Guinness, lol. Thanks for the wonderful recipe! Wonderful stew! First time cooking lamb here and also substituted half the stock for Guinness. I will definitely make again. Yum! This was fabulous. I had a left over leg of lamb in the freezer and followed the recipe exactly. Added a cornstarch slurry to thicken it up at the end, and it was dee-lish. Mine too! Keeping this one in the books. One of the best stews I have ever made in the Instant Pot. Terrific flavour, especially the gravy. Many thanks. A little heavy with the bacon. Next time I will use maybe two slices. cheers! I had my ggson find a lamb stew recipe I am about to begin , I have read the people s review .in full trust it’s going to be great!